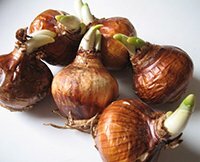 Forcing bulbs is a process through which you induce a plant to begin its growth cycle ahead of its normal schedule, outside of its normal environment. Good examples of forcing bulbs are Easter flowers. If Easter flowers were planted in pots outdoors, many of them would never be in bloom when the peak sales period comes. 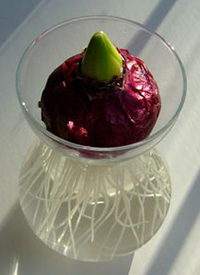 There are other reasons for forcing bulbs indoors as well. It is actually possible, believe it or not, to have full blooming tulips and daffodils and hyacinths indoors over the winter months. There are few things that can chase away the cold and the gloom of winter like the sweet fragrance of spring flowers, and the colors they bring. Learning how to force bulbs is not all that difficult and here we will discuss the steps towards this goal. Choose Your Container: The first step in learning how to force bulbs is to choose what pot or container you want to put the bulbs in. Since the bulbs will stay in these pots for their entire life, you need to make sure you choose one of ample size to give the bulbs enough room, otherwise your work will be for nothing. Whether you choose clay or plastic for your bulbs, it makes no difference, the bulbs can grow just as well in either type of pot. Before you begin, the pots should be well cleaned and if you decide to go with clay pots, soak them in water for a couple hours so that the pores in the clay will be saturated. Choosing The Bulbs: The right bulbs will make all the difference as you start forcing bulbs. 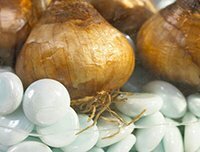 You need to evaluate the bulbs the same way you would produce at your local grocery store. Remember, the bulbs have already stored up all the nutrients from the previous growing cycle, so you are going to want the biggest and best looking bulbs you can find. If the bulbs are soft, or already sprouting, you may not achieve the results you are hoping for. If you order your bulbs via mail order, be sure you choose a reputable company, not just the one with the cheapest bulbs. You get what you pay for! Make sure you order them early enough so that you have ample time to get them before October. The bulb is one of the most important steps in learning how to force bulbs, so don’t cut corners. Soil Mix: As you start learning how to force bulbs, you will quickly realize that there are endless options for soil that you can choose from. How do you know which one to use? One general rule of thumb is to create your own blend using equal parts of potting soil, sand, peat moss, and perlite or vermiculite. This will give your bulbs the right mix of moisture and drainage. Prior to planting, you will want to water the soil mixture enough to make it damp, but not soggy. If your plan is to eventually plant your bulbs outdoors the following year, then you can use a 5-10-5 fertilizer at the rate of 1 teaspoon per quart of mix. This will help to give your bulbs and little boost once they are done flowering. Planting: The next step in learning how to force bulbs is to plant them. The containers you chose in step one should have drainage holes in the bottom of the pot. These are essential to the process so we will need to make sure they don’t clog up, or allow the soil mix to run out during watering. A simple way of accomplishing this is to place a few flat stones, or pieces of broken clay pots over the holes before filling the pot with soil. Start off by filling the pot halfway with your mix and then start arranging your bulbs, pointed end up. You will want to place the bulbs as close together as possible, but they should not touch each other. Some bulbs have a flat side to them; turn the bulbs with the flat side towards the container’s edge. This will cause the initial leaves to grow outward, forming a border. 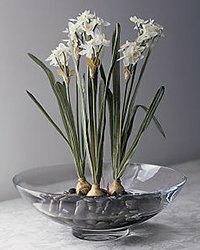 You may need to adjust the soil level under each bulb as you will want the tips of the bulbs to be level with the rim of the pot. Fill the pot the rest of the way with your mix, and then water it thoroughly, to force the soil to settle. Storage: So far forcing bulbs isn’t that challenging is it? Now that you have your planted container, you will need to place them in a location that is both dark and cool, such as a basement, a cold frame, or a garage that isn’t heated. This cold storage is vital to the process of forcing bulbs. You are looking for an ideal temperature range of 35 to 50 degrees. You can even cover the pots with black garbage bags if you have to put them in a location that isn’t dark all the time. Keep the soil moist during this process, but not soaked. After about 6 weeks or so, you should start to see roots coming out of the drain holes in the containers. 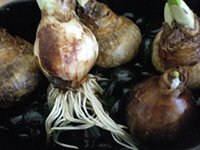 Coming Out of the Dark: Once you see a few inches of shoots above the soil, and white roots pushing through the drainage holes, it’s finally time to take the bulbs out of storage. You don’t want them outside just yet, but rather in a place with indirect light, and a consistent temperature in the 50’s. Continue to water them as needed. In a few weeks you will see flower stems and buds form. Move the plants to a sunny location until the blooms start to open, then move them back to indirect sunlight to force a longer blooming period. You’ve now learned the basics on forcing bulbs. As with anything practice makes perfect and after a few tries under your belt, you should be a pro in no time!